Definition: Collagenase is an enzyme that breaks down collagen in damaged tissues within the skin and helps the body generate new healthy tissue. It is considered a virulence factor, facilitating the spread of gas gangrene. Collagen is a type of protein that connects and supports fibers in body tissues such as skin, tendons, muscles, and bone. 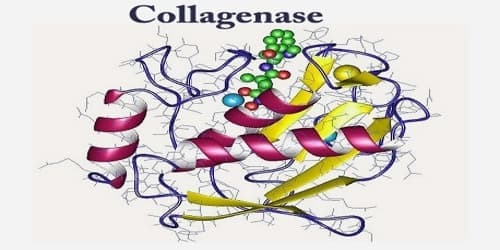 Collagen, a key component of the animal extracellular matrix, is made through cleavage of pro-collagen by collagenase once it has been secreted from the cell. This stops large structures from forming inside the cell itself. Collagenase topical (for the skin) is applied to severe burns or skin ulcers to help remove dead skin tissue and aid in wound healing. It may also be used for other purposes not listed in this medication guide. In addition to being produced by some bacteria, collagenase can be made by the body as part of its normal immune response. This production is induced by cytokines, which stimulate cells such as fibroblasts and osteoblasts, and can cause indirect tissue damage. The enzymes in collagenase topical may increase our risk of a bacterial infection in our bloodstream. Call the doctor at once if people have any signs of infection such as fever, chills, rapid heartbeats, nausea, vomiting, stomach pain, or feeling very ill.
treatment of Dupuytren’s contracture and Peyronie’s disease (Xiaflex). Use exactly as prescribed by the doctor. Do not use in larger or smaller amounts or for longer than recommended. Follow the directions on the prescription label. Before applying collagenase topical, rinse the skin area several times with normal saline solution or other cleanser recommended by the doctor. Collagenase topical may be less effective if people apply it to skin that has been treated with certain cleansers or antiseptic solutions. 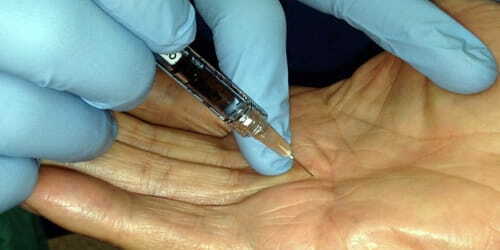 Remove as much of the loose tissue as possible before applying the medication. The doctor may recommend using an antibiotic powder on the affected skin before people apply collagenase topical. Follow the doctor’s instructions about the type and amount of antibiotic powder to use. Collagenase is used during a bacterial attack to degrade the collagen barrier of the host during an invasion. Vibrio bacteria are sometimes used in hospitals to remove dead tissue from burns and ulcers. Clostridium histolyticum is a pathogen that causes gas gangrene; nevertheless, the isolated collagenase has been used to treat bed sores. Collagen cleavage occurs at a Xaa+Got in Vibrio bacteria and at Yaa+Gly bonds in Clostridium collagenases. Collagenases may be used for tenderizing meat in a manner similar to widely used tenderizers papain, bromelain, and ficain. Side Effects of Collagenase: Get emergency medical help if people have any of these signs of an allergic reaction: hives; difficult breathing; swelling of their face, lips, tongue, or throat.